Doubleday Books for Young Readers, 9780553523225, 160pp. 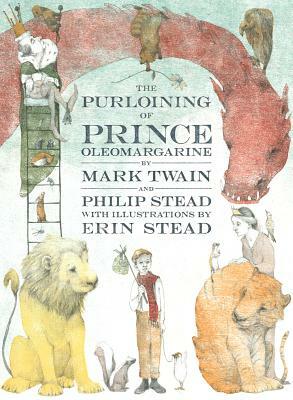 A never-before-published, previously unfinished Mark Twain children’s story is brought to life by Philip and Erin Stead, creators of the Caldecott Medal-winning A Sick Day for Amos McGee. In a hotel in Paris one evening in 1879, Mark Twain sat with his young daughters, who begged their father for a story. Twain began telling them the tale of Johnny, a poor boy in possession of some magical seeds. Later, Twain would jot down some rough notes about the story, but the tale was left unfinished . . . until now. Plucked from the Mark Twain archive at the University of California at Berkeley, Twain’s notes now form the foundation of a fairy tale picked up over a century later. With only Twain’s fragmentary script and a story that stops partway as his guide, author Philip Stead has written a tale that imagines what might have been if Twain had fully realized this work. Johnny, forlorn and alone except for his pet chicken, meets a kind woman who gives him seeds that change his fortune, allowing him to speak with animals and sending him on a quest to rescue a stolen prince. In the face of a bullying tyrant king, Johnny and his animal friends come to understand that generosity, empathy, and quiet courage are gifts more precious in this world than power and gold. Illuminated by Erin Stead’s graceful, humorous, and achingly poignant artwork, this is a story that reaches through time and brings us a new book from America’s most legendary writer, envisioned by two of today’s most important names in children’s literature. MARK TWAIN (1835–1910), considered one of the greatest writers in American literature, was born Samuel Langhorne Clemens in Florida, Missouri. As a young child, he moved with his family to Hannibal, Missouri, on the banks of the Mississippi River, a setting that inspired his two best-known novels, The Adventures of Tom Sawyer and Adventures of Huckleberry Finn. Twain and his wife, Olivia Langdon Clemens, had four children—a son, Langdon, who died as an infant, and three daughters, Susy, Clara, and Jean. PHILIP STEAD is the author of the Caldecott Medal–winning book A Sick Day for Amos McGee. With his wife, illustrator Erin Stead, he also created Bear Has a Story to Tell, Lenny & Lucy, and The Purloining of Prince Oleomargarine. Philip has also written and illustrated his own books, including Hello, My Name Is Ruby; Jonathan and the Big Blue Boat; and A Home for Bird. Philip and Erin live in northern Michigan. Visit Philip online at philipstead.com. ERIN STEAD is the illustrator of eight highly-acclaimed picture books: the Caldecott Medal–winning A Sick Day for Amos McGee; The Purloining of Prince Oleomargarine; Tony; And Then It’s Spring; Bear Has a Story to Tell; Lenny & Lucy; If You Want to See a Whale; and The Uncorker of Ocean Bottles. She lives in northern Michigan with her husband, author/illustrator Philip Stead. Visit Erin online at erinstead.com.